This fall we have launched a new children's program. With the help of resources provided by Roberts United Methodist, Seveirville, TN., we were able to invest in a bilingual children's education. 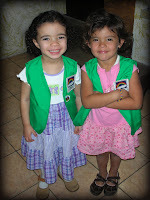 Our children's ministry is a the Raindows and Rangers Program. It includes lessons from the Bible in an everyday environments and Bible memorization. While we are just beginning with this program, it is showing itself with great promise. Under the direction of Tonja Johnson, children are being bussed in from the neighboring communities. We are seeing growth. not so much in numbers at this point but more in the structure and involvement of volunteers and the interest of the children in the church.